My previous post – “How a Few Offenders Create Industry-Wide Reputational Issues: ‘The Reputation Commons Problem’” – focused on how the collapse of Rana Plaza created a reputation commons problem for the apparel industry. In review, a Reputation Commons Problem occurs when the careless actions of a one or a few companies have negative repercussions for other companies within that same industry by drawing attention to social or environmental issues common to that industry. So, how have apparel brands responded since the collapse to fix the reputation commons problem? Some have taken sincere actions that have both improved the working conditions at their suppliers and the industry’s overall reputation. Others have been accused by NGOs of taking only symbolic actions in an attempt to appear as if they have made improvements, when none have actually been made. Others still have done nothing at all. After a catastrophe industry members can reduce public and NGO pressure by joining corporate social responsibility (CSR) programs as a show of good faith that the industry can handle these issues on their own (e.g., King, Lenox, and Barnett, 2002). It’s not surprising then that industry specific CSR programs are often created (or gain tremendous popularity) after a catastrophe occurs. In the wake of the publicity surrounding the collapse of Rana Plaza, two groups were created: the Bangladesh Accord for Fire and Building Safety (the Accord) and the Alliance for Bangladesh Worker Safety (the Alliance). Originally conceived in 2010, the Accord was designed to be a voluntary program, requiring member brands to make a 5-year binding commitment to improving fire and building safety at their Bangladeshi suppliers. However, despite additional tragedies including another garment factory collapse in 2005 and a series of fires at factories (supplying to major apparel brands like JC Penney, The Gap, and VF Corporation) the Accord failed to receive enough support from companies to be successful (Clean Clothes Campaign, 2013). Sadly it took the collapse of Rana Plaza to create sufficient public attention to the appalling health and safety record of the Bangladesh garment industry to drive members to join the Accord. Just one month after the collapse more than 40 apparel companies had joined. Currently, there are more than 200 members. The collapse also led to the creation of a second group, the Alliance, which was spearheaded by The Gap and Wal-Mart. The programs have similar goals of auditing Bangladesh garment factories and making needed improvements. They even have similar sounding names. However, the Alliance has received scathing criticism from NGOs as being a watered down and symbolic version of the Accord. This is largely because unlike the Accord, membership in the Alliance is not contingent upon a legally binding commitment to take actions that would improve factory safety conditions. It also lacks the same level of transparency regarding the results of the audits. 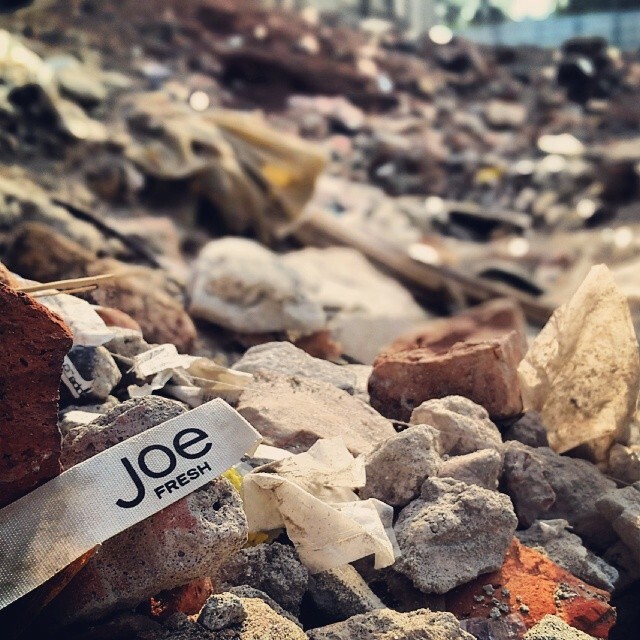 Consider the example of Joe Fresh, whose branded apparel was found at the site of the Bangladesh factory collapse. In the digital era a photo in the rubble can be immediately televised globally; the punishment of the brand swift, unmerciful and devastating. In this example, irate customers vowed to boycott Joe Fresh. But, because Joe Fresh responded quickly by committing to paying compensation to the victims and by joining the Accord, Joe Fresh managed to escape public backlash. Companies are incentivized to appear as if they are taking action, without actually making any expensive improvements. This practice is known as “greenwashing” when referring specifically to environmental practices. However, it’s incredibly difficult to know the company’s intent. Are apparel companies trying to manipulate the public into thinking that they will take action, when they never really intend to do so? Or, will they actually pony up the cash and make improvements? Further complicating matters for stakeholders, it is possible for apparel companies to join either program symbolically. Given the less transparent nature of the Alliance, it is impossible to tell which members have not contributed to making improvements to factories. Moreover, even the more stringent Accord, some brands are marked as having failed to pay the program’s dues. So much of the debate surrounding the industry’s response to Rana Plaza has been about whether members of the Accord or Alliance are contributing as much or even at all to the overall improvements in Bangladesh. However, this debate ignores the set of apparel brands that really deserve criticism: those that source from Bangladesh but haven’t joined either group! This post is based off of a working paper by Susan Kayser (Kayser, 2015). Clean Clothes Campaign. 2013. The History behind the Bangladesh Fire and Safety Accord. July 8. Accessed December 2015, http://www.cleanclothes.org/resources/background/history-bangladesh-safety-accord. Barnett, ML. 2006. Finding a working balance between competitive and communal strategy. Journal of Management Studies, 43: 1753–1773. Barnett ML, Hoffman AJ. 2008. Beyond corporate reputation: Managing reputational interdependence. Corporate Reputation Review, 11(1), 1150-1170. Barnett ML, King AA. 2008. Good fences make good neighbors: A longitudinal analysis of an industry self-regulatory institution. Academy of Management Journal, 51(6), 1150-1170. 1 Source: http://bangladeshaccord.org/signatories/. Last accessed December, 2015.